From baseball to basketball, and football to soccer, Watchfire offers fixed digit scoring solutions for schools and athletic facilities of all sizes. 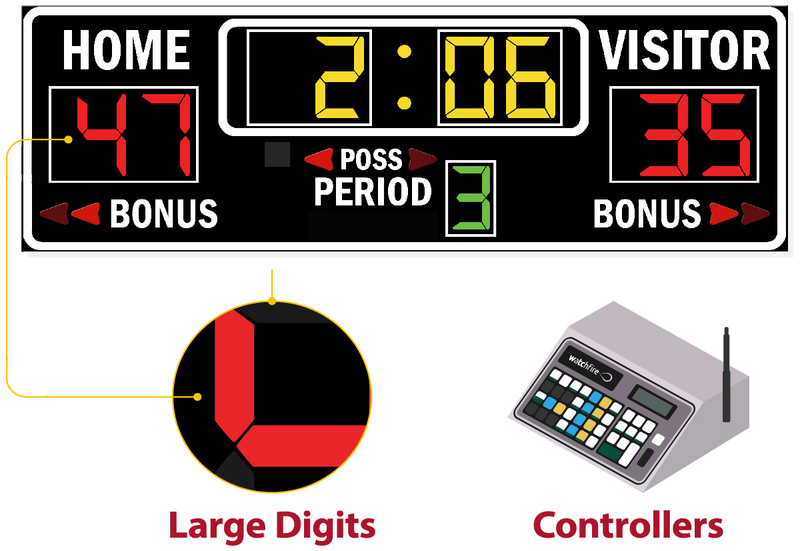 Watchfire offers turnkey solutions for a wide array of scoreboards, controllers and timing components. They are ideal for indoor and outdoor facilities, including schools, sport complexes and municipal athletic centers. Every scoreboard carries Watchfire’s five-year warranty and 10-year product support. Scoreboards are configured for football, basketball, baseball, softball, volleyball, wrestling, track and field, hockey, soccer, tennis, swimming or multipurpose uses. Watchfire can customize scoreboards for any sport requiring a clock and home/away scoring. Scoreboards can be personalized with team colors and choice of LED colors. Fixed digit scoreboards can be paired with Watchfire video displays, either at the time of installation or during system upgrades. This combination creates an attractive and versatile system that enhances the fan experience and generates revenue. Ready to Upgrade Your Old Scoreboard? Request a Quote Now. Learn how to score new fans and boost ticket sales with a new Watchfire LED sign at your sports facility.